Bought these for shoreline plantings of native species. Did not disintegrate quickly which was a concern. The plants love the nesting and are growing well after 10 days. Only 1 arrived damaged. Good price for this product. I am sorry to say I cannot recommend the Cow Pots. I applaud the ingenuity and wish the folks well, but the seedlings I started in these pots are none of them doing well. Same type of seeds in plastic are much bigger & stronger, planted same time. Too bad. very pleased with the cowpots so far. They were boxed well and do not smell at all, neither dry nor wet after use. They are holding well in the greenhouse so far, one month after starting adding soil and seedling. only remaining question is how they will do once planted and if they will break down properly or inhibit the growth of the plant at all. They did what I needed them to do. I've tried a lot of pots for growing transplants - - peat, coir, plastic, newsprint, and jiffy - - and the cowpots have yielded the best results. They allow transplanting without root trauma, but they don't restrict root growth, and they don't persist in the ground for years afterward. They actually seem to enhance growth. Buying them in quantity keeps them affordable. I'm convinced enough to use them for all my seedlings and even for rooted cuttings. I like these cow pots a lot. I used them last year to plant my melons and it enabled me to start my melons earlier and I had great success in being able to put them in the ground with out losing any plants (melons are hard to transplant otherwise). I can vouch for the pots being durable in handling and in storage. We used cow pots to start some tomato plants last summer. Had a few pots left over. After sitting on our patio for 8 months those pots seem to have the same integrity as they had when new. I should mention that it really is important to cover every trace of the pots when transplanting. Parts that stay above ground are surprisingly durable. Parts that get buried seem to decompose as advertised. For my garden, I like to start my own seeds, so I can choose the exact species of plant. I have these germination trays that hold water with a capillary mat over the top that wicks water up into the Cow pots. I prefer cow pots to jiffy peat pots because the roots of the new plant will grow thru the cow pots with greater ease, and I can just plant the cow pot and plant together. Don't put them too close to one another in trays or mold will grow between them. Otherwise, perfect. Very well pleased so far. I have just recently potted vegetables in these pots placed in trays.I'assuming the pots will remain intact until I can remove and plant. They appear to be holding up well with daily watering in the trays. I have Stupice tomatoes in cowpots and 2qt (larger) plastic pots, right next to each other in my inner greenhouse. Both have my custom grow mix. The plants in the cowpots are twice as big. It must be a moisture control issue in our erratic high desert/ greenhouse environment. Just what my garden seedling start needed! TY! Quick delivery no damage product works great for me planting oak and chestnuts in them. Nice product, well made, excellent, absorption when bottom watered to sprout seeds. Will purchase again. Exactly as stated. Product works great and at a great price. Roots grew through container with no problems. I discovered Cow Pots while I was searching for an alternative to peat pots. The mining of peat moss destroys wetlands and habitats and releases long stored greenhouse gases.Once I understood the problem I decided I had to wean myself off of those so-easy-to-use peat products.Using Cow Pots seemed like a perfect alternative .I decided to use the 4 size pot as it seems like a generous,roomy home for a seedling. I've been using smaller sized peat pots and they seemed to dry out too quickly.On most of the sites where I viewed the Cow Pots they were sold in small quantities and the cost of buying a lot of them seemed prohibitive . I am delighted with the price of $39.+ shipping for 180 4 pots. The order shipped promptly and arrived in excellent condition. They are actually quite sturdy. I am very happy to have discovered the Greenhouse Megastore. no comparison. Cow pots are the best. My transplants really prospered in your Cow Pots. all the transplants are growing great; customers at the farmer's market seem to like them.they are better that plastic pots; we would recommend them to any gardener or farmer. I recently moved to a locale that has a very short growing season. June 15 - Sept 15 is all I can count on. I start seeds indoors in tiny pots, then transplant them in to the 4 square cow pots which go into my sunroom, and then my hoop house until I can plant outside. The cow pots are perfect for this purpose. They have a slight odor for the first day or so after planting, but that subsides quickly. No transplant shock and any bits that I break off or remove can be composted. I do recommend soaking the pots for a few minutes to hydrate them prior to planting. Your store has a great price for them and quick delivery. Good size; planted tomato plants in them to start indoors. Roots will grow through it when I plant outdoors. Excellent purchase!! I buy these every year. They are convenient & green. The cow pots are the perfect size. They fit the trays with no space between for easier filling with potting soil. Planting the cow pots in the ground also keeps any weeds or grass from growing too close to the plant. Nice and sturdy. Pleased with the cow pots. Love this product! Have used it in the past but seedlings flourish in this media!!! These little pots are really fabulous. I used over 300 last year and ordered the same this year. The seedlings did great and where we live (high desert) anything that you can put into the ground with a little extra something is always a good thing! Very substantial. Next time I order I will order the smaller size for most things. Description states that there is no oder. There is definitely an odor. I had to move them to my basement under a grow light because they stunk up my house. I received my order very quickly and was pleased with the condition of the order on arrival. The Cow pots seem to be just what I want for up-potting my tomato seedlings. The pots are as described in the catalog. Cow pots are the best growing pots I have ever used for my plants. However, they are a little expensive. I still buy them because their performance is the best. Love the size of these pots and the fact that you can plant the plants with no disturbance of their roots and that they will be fed naturally with lots of nutrition. Great idea. No smell and the size is larger than the normal peat pots I can get. Will order again. Thanks. I used Cow pots for the first time this year and I must admit I did see a difference in how well my plants are growing. The secret is to not leave the plants in the cow pots too long. As soon as they take root plant them in the ground and see the plants take off. VERY PLEASED with the service I got from greenhousemegastore.com with my order for Cow Pots.Your prices were the best, and they arrived very quickly. I'll be ordering again, for sure! These pots work well for my seedling palms and moringa trees. And they don't disintegrate like peat pots before you are ready to pot the plants.Great value. Cow Pots are terrific. Eight of the square 5 Tall pots fit perfectly on a standard tray with no wasted space. They are holding up as advertised. These are a great idea, but, they don't fit well in trays, they rip easily and the pots dry out quickly. Love these Cow Pots - planted 54 of them with Sweet Peas and all but two pots sprouted like mad. Pots are holding together well after three weeks of watering...great product! Love these pots! I use them for peppers, tomatoes and cukes. Best of all, they decay completely and feed plants at the same time. Prefer these over the peat pots. Available in 3 different sizes(I believe). 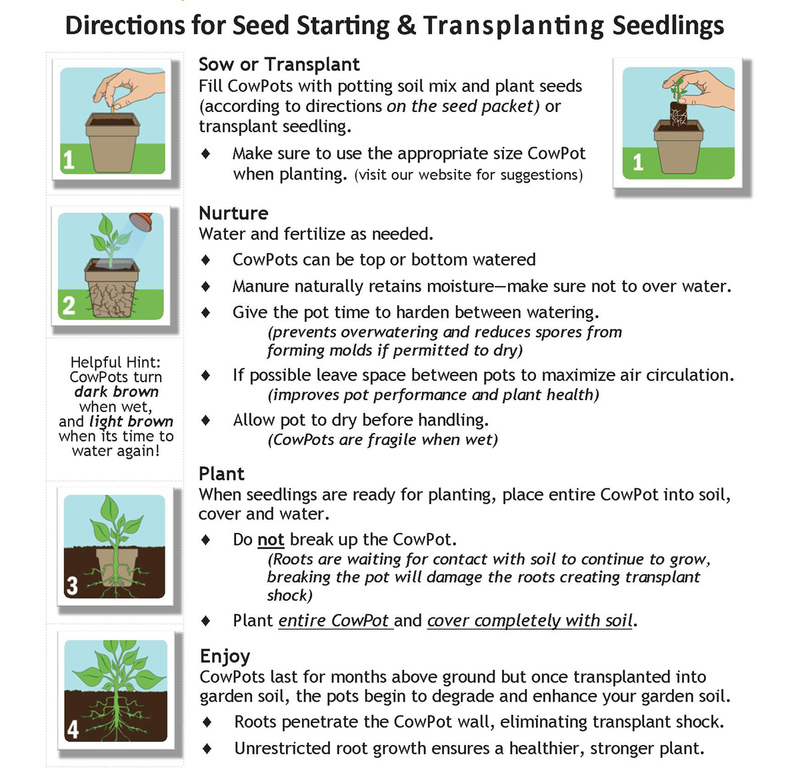 Saves you the trouble of transplanting seedlings, or, if head starting indoors. Just take the entire pot and place in planting hole in your garden or garden bed. I actually have these in a 1020 seed starting tray with dome and they are holding up very well with the humidity(no signs of deterioration). Cow pots should contain organic matter so, plants are being fed with continuous traces of added nutrient from the pot itself. As always, nice product through GM at a good price. Available as single or multi purchase. Being a home grower, I only ordered 10 pots but, will definitely be ordering again. You can't beet cow pots for quality. Plants love them. The down side is they are more expensive than peat pots and they are only good for about four months before they start falling apart. Regardless, I think they are the best. I have been using Cow Pots for the last three years and I love them. They can be fragile when the pots are moist, you just need to be careful. If you intend to handle them, let them dry out some. We grew 300 plants using the pots and only 2 of the pots had any disintegration while in their trays. Planting them in the ground is so easy it really cut down planting time. We used the 4 square, much easier than the round Jiffy's we had been using. I have been using cow pots for tomato plants that I start from seed because I can put them into the ground and be certain that the pot will disintegrate--also providing nutrients from the cow manure. I donate my extra plants to the food bank garden project and the cow pots assure that the plants will be in good condition when they are planted in community gardens. I soak the cow pots in warm water for about 30 minutes before I pot my seedlings to prevent them from drying out: it works like a charm! This is my 2nd year of ordering cow pots and I absolutely love them. I start my seeds in them and will either bury them in a big pot with 1/4 sticking up while they germinate and grow or on a tray for items not having a big root system. I tried the cow pots last year for the first time and absolutely love them. Only downside to other biodegradable pots is they do start breaking down after about three weeks. So don't put your plants in them until about three weeks before you plan on putting them in the ground. Thank you Thank you Thank you - you got a lot of business coming your way from us! Good product and excellent delivery time to house. I have used these and they are great, easy to transplant and plants are much happier, got a lot larger yield this year. Also, if you go to the manufactures website, the mushrooms are perfectly normal, and there are ways to minimize them. First experience with cowpots, but they make a lot of sense. My gardening skills, however, require serious honing to be successful! First time I use this product. And, was impressed on how well it works! They were biodegradable just as was indicated. will definitely use them again more frequently. I loved these cowpots. they are better than the fiber ones or anything else I have tried. grew right through them but they never fell apart even w/a lot of rain this year. put in ground and already have blooms...awesome! Excellent for transplanting starts. Unlike peat pots there is no need to remove the pot when planting in the ground. The roots grow right through. Highly recommended. I have been growing my garden from seed for years, and have never been satisfied with the Jiffy pots or other brands. This year I used Cow Pots, and I could not be happier with the results. They are great quality, my seedlings grew faster and seem healthier than past years. Great product, and I completely recommend. My order arrived in perfect condition and right on time as scheduled. I love the product(s) and will definitely order from you again. Thank you. Awesome deal for buying these in quantity. They came packaged in an original case and had no damage. I am just starting to use these but they seem good. They hold together well while I am potting into them. I haven't worked with them long enough to tell how they do once planted. Pots arrived with no breakage.About to transplant seedlings into these pots. Hoping for an abundant year! THESE COWPOTS ARIVED VERY QUICK AND IN GREAT SHAPE. I WANTED SOMETHING THAT I COULD PUT RIGHT IN THE GROUND WHEN MY SEEDS HAVE GROWN TO THE SIZE I WANTED. COULDN'T BE ANY HAPPIER. Exactly what I ordered, fast delivery, arrived in good shape, reasonably priced. Ordered once before and it was also very good. These pots were perfect for the job. They are sturdy and well drained, they are so easily placed into the ground when the plants have sprouted. We combined them with compressed dirt pellets and had a super easy craft for small children. They drain well and hold up to transport as and un-gentle use by children. Good Product! I might rate this higher in the future but for now, I've seen reduced germination using these pots vs regular plastic. The pots and plants seem to hold up better if they are not allowed to get completed soaked through. Water just enough so that this doesn't happen. And, a large percentage of my pots have developed mold and actual mushrooms growing on the side. Not sure if this is an issue - we shall see. I did receive a package with 50, count 'em-although you really can't see them, 50 cow pots. They came in a big box and nothing was wrong with the shipment at all.I was concerned about the name as I wanted to plant tomatoes and hoped that being named cow pots I didn't have to become a bovine herder.All in all, I'll buy again and probably be as irreverent when I write the next review.All the bestens. The pots came so well packaged! None were damaged. In less than a week, my first seedlings had germinated. I can't speak for the customer who said she had a mushroom problem after transplant because it's still early, but the pots are the perfect size and my seedlings are loving them! The cow pots are very study and of ample size. The price was great. The only downside about them is that they are smelly. They smell like, well I guess it's a little obvious, dried cow poo. So be careful where you plan to start seeds in them. Go these to get plants started in my green house. Like that they are biodegradable and will help impove the poor soil I deal with here in New Mexico. I bought 300 of the 4 inch pots this year as I start all the vegetables in my garden from seed. I loved them. I like that there is less damping off than with plastic pots and that the plants never get root bound, as the roots just grow right through the pot. My only concern is where to get the trays that are shown in the picture in the description. A typical 10x20 tray doesn't fit them very well. Does anyone know how or where to order the trays that have the compartments in them for the individual pots? There is no doubt that these are a great benefit when potting-on. Compared with the coir pots I used at the same time on the same batch of seedlings the Cow Poo Pots produced much stronger and healthier plants. I have just ordered more! I bought 300 as I start all my vegetables from seed. I have only used 6 so far and 4 of them sprout mushrooms every night. It's not the seed starting mix as I've used the same batch in peat pots and Styrofoam trays and they're all fine. It seems they were not sterilized properly from the manufacturer. If anyone has a suggestion to sterilize the remaining 296 I'm all ears. 1. NO....there's no odor, trust me. A totally ingenious way of starting or transplanting your seedlings to a rich potting environment consisting of my choice, Ultimate Potting Mix, Cow Pots, a rich combination of Fertilizer (I use Jacks) and Triple-Action Insectide. It's totally simple, uncomplicated, and clever. 2. Wondering about the Cow Pots - what happens? Well, the combination of rich potting mixture, and regular watering degrades the cow pots which themselves contain natural fertilizer. When the seedlings meet the added fertilizing qualities of the Cow Pots, it's practically instantaneous.....you see results, and over time, not much, the Cow Pots degrade into the soil, enriching the environment for your plants to thrive on. 3. My recommendation is if you want to FOOL MOTHER NATURE......use COW POTS with everything you grow....flowers, bulbs, vegetables even Orchids.